Doubletake is back and we’re better than ever. New team members, updated branding and all the classics you love and remember. Doubletake on Blogspot is now “Double-talk: A Forum for Discussion and Tips.” We’re more social than ever because of everything going on this summer from new clients to grand openings, but mostly because we’ve hired a Social Media Specialist to manage and beautify our social media accounts! Mady Dudley is a recent graduate from Florida State University with a bachelors in Editing, Writing and Media. She loves social media because she believes that it is a perfect platform for showing your highlight reel to the world and a great way to promote yourself. So let’s get into the main topic. We know that it says social media, but in reality it is such an important and useful asset for networking and business development. Rather than making social media platforms a way to catch up with old friends or keep up with current ones, we think of it as a way for your business to constantly display all of the newsworthy content that you’re putting out on a regular basis and/or changes that you are making to your brand along with a behind the scenes look of what you do. We have learned this in our own journey with the development of our social media. Consumers today place an emphasis on putting their money where their mouths are when it comes to supporting businesses large or small and social media allows for an extension of brand and to go into more detail about what you are all about. You do incredible things (whether that be your products themselves or charitable donations) so don’t let them go unnoticed. Social media is pretty much a second or third website for your business and is much easier to access and use. It also includes links to existing business information like websites. Facebook, Instagram, Twitter, Pinterest, Google Plus, and more are all there to showcase you and all that you are capable of. Yes, we know it’s time consuming, especially with all of the different social media formats out there today. But it’s so worth it. So that’s where Doubletake comes in. With someone taking care of your social media needs that means that you’re no longer on a time constraint for the tedious task that is becoming popular on social media. We will always be “home” on your social media and we will provide an online presence that will assist and impress you and most importantly, your clients. 1. Building Relevant Audiences: With a focus on localness, Doubletake uses strategic methods to draw in your desired crowd and make your voice heard in the sea of online chaos. 2. Creating Engaging Content: We cut through the chaos with entertaining and eye-catching work that we make for you. We build content that will intrigue new customers and exhilarate current ones. 3. Encouraging People to Show Their Support: Interactions online are fine and dandy but we know what really matters is people showing up and giving their physical or monetary support. 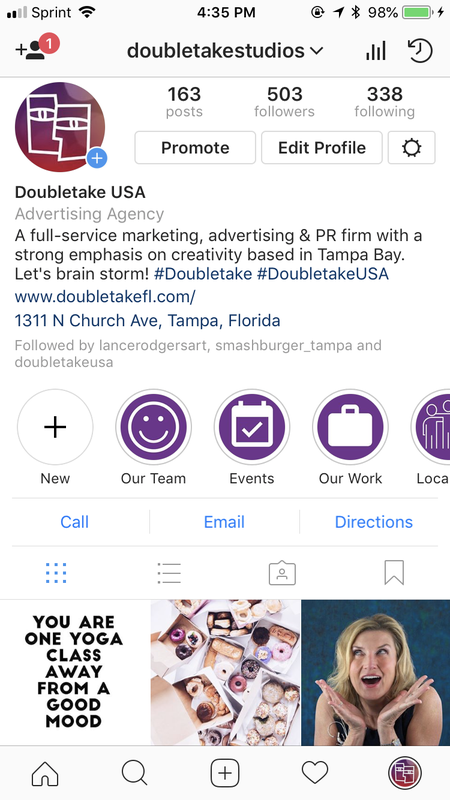 Doubletake has proof with past clients of customers finding out about their business location through social media and expressing their excitement to visit. 1. Don’t Be A Robot: Posting without purpose or inspiration is a no go. Let your posts show your passions, aim to inspire your audience or at least try to add a smile to their day. 2. Don’t Be Annoying: Do not, I repeat, do not post too much! 3. Do Be Tolerably Annoying: Although you don’t want to post too much, post consistently. Twice a day on each social media format is reasonable and not too bothersome. 4. Do Use Hashtags and Interact: Hashtags are a great way for people who don’t already follow you to find you and follow you based on your interests and common themes associated with your brand. 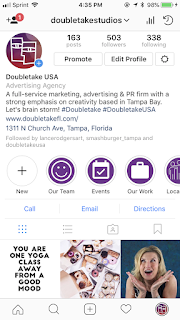 Post hashtags that #have #to #do #with #your #company #DoubletakeUSA. Interaction is key when it comes to keeping current followers. Follow them back and tell them what you like about them! 5. Stay On Brand: But do something edgy every now and then. Ads are boring nowadays, why fit in when you were born to stand out? Now that you have the tips for social media successes, go forth and conquer! And hey, if you run into any trouble Doubletake is just a call away. See you next week for another blog update!